The Fourr Ranch is located in southeastern Az approximately 50 miles east of Tucson. 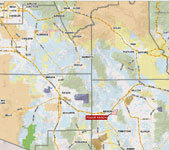 Access is via I-10 and the Ranch is located approximately 4 miles south of Dragoon. The Ranch lies on the Northwestern side of the Dragoon Mountains. This area has had a colorful past, there were several battles with the apaches Indians, and it is said that the great Apaches chief Cochise’s body was hidden in Cochise Stronghold just south of the ranch. The main house at the ranch headquarters served as a Stage stop and early army post, for the soldiers of Fort Huachuca. 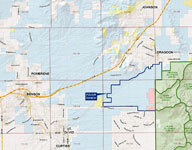 The Fourr Ranch consist of approximately 1,280 deeded acres, 11,610 Az State Grazing lease 05-033, and 3,689 acres of Coronado National Forest Grazing Allotment #501101. 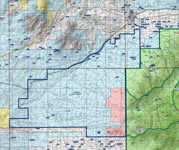 For a total of 16,579 acres or 26 sections. The total carrying capacity is for 250 cows yearlong. (The past few years the owner has had an agreement with the Forest to graze the neighboring allotment (Dragoon) which has jumped the number up to 300 head). The Ranch has a mild climate with summer highs in the mid 90’s and winter lows in the 30’s. Precipitation averages 14 inches, the elevations range from 4,200 to 6,500 feet above sea level. The Ranch is well watered with 5 wells, the main well is solar powered and feeds 3-25,000 gallon Storage tanks that waters the headquarters as well as several pastures, off of pipe lines, throughout the ranch. The other 4 wells are windmills with Steel rim storage Tanks and pipelines feeding drinkers. Several dirt tanks, as well as springs and seeps on the forest allotment. The main house at the headquarters is approximately 2,700 square feet, with three bed rooms and 3 bath rooms, and office, built in the 1880’s with many upgrades. The foreman’s house is approximately 1,800 square feet with 3 bedrooms and 1 bathroom. The gardener’s house is approximately 1,400 square feet with 2 bedrooms, and 1 bathroom. There is also a Bunkhouse consisting of 2 rooms and 2 bathrooms. A 45x80 metal shop, with electric and a concrete floor, a 45x80 Quonset hut horse barn with approximately 6 stalls and hay storage. A set of panel corrals, with other out buildings. The ranch electric is provided by Sulphur Springs Electric cooperative. Telephone and internet are provided by Valley telecom, most areas of the ranch have cellular service. Propane is provided by local suppliers and sewage is by septic tanks. The Fourr Ranch is one of the nicest ranches on the market today and its location adds to the possibilities, the land tenure, with both mountains and grasslands makes the Ranch easy to operate. Rarely do you find a ranch of this quality, close to town, come on the market. Please click here to download (about 18 MB) a printable brochure in Adobe Acrobat format. If you get frustrated trying to make this work on your computer, don't hesitate to ask us to mail you a printed and bound brochure instead.